The green color of the lawn grass is the one common measure homeowners use to compare their properties beauty with that of a neighbor. 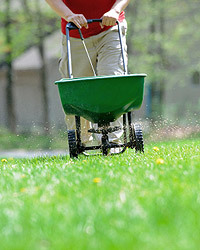 Regular lawn fertilizing maintenance can and should do wonders for your lawn and landscape. Ask any realtor, a beautiful lawn that is always green raises your home's curb appeal and thusly, your resale value. It also makes your neighbors jealous, which in some strange way, makes you happy! Yard fertilizing can be tricky with so many types of grass, seasonal considerations, and different fertilizer formulations. It is hard to know where to begin. At Green Solutions the proof is in the color of your yard. We provide a combination of broad leaf weed control, insect management, disease or fungus treatments, and of course fertilization applications. The treatments are designed to target the large majority of home lawn care issues you might possibly have. Our typical lawn fertilizer services are properly timed against the calendar, and the visits are spaced about 7 weeks apart unless you choose to be treated on a monthly basis. We utilize both granular and liquid fertilizer formulations, depending on the season. Our lawn service even covers you for grubs, chinch bugs, sod web worms, and diseases. Lawn and landscape fertilizing makes your grass and shrubs strong and healthy, and it helps them maintain vigor against the stresses caused by plant disease, lawn insects, winter damage, and dry weather. Let the experts of the number one Tampa lawn fertilizing company take care of all your turf, sod, and lawn fertilizing solutions with our 80 years of experience in fertilizing lawns and landscapes. Contact us today for more information by requesting a FREE Consultation with one of Florida's best lawn care and pest control specialists, Green Solutions.